Do you own a large television with a VGA or a spare HDMI port? Ever wanted to display multimedia content from your laptop to that television? I have, and for time had to settle with my laptop being over by my TV while I sat on my couch. The configuration was only irritating if I needed to change what I was looking at. Why bring this up? 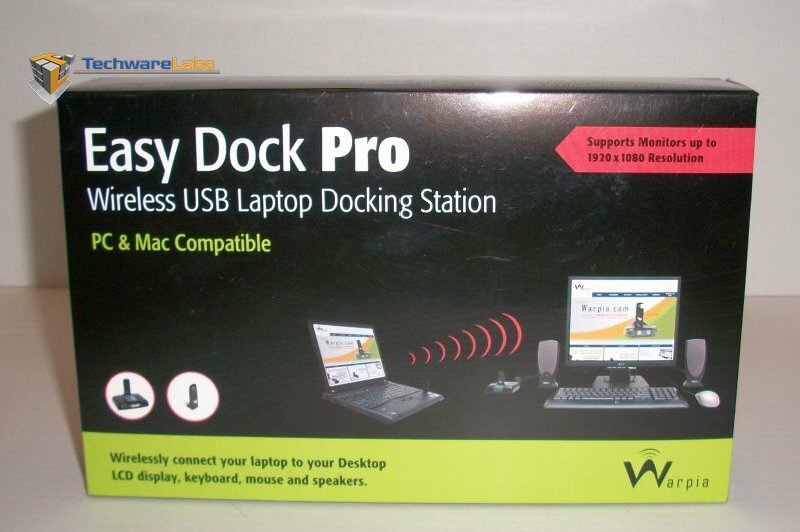 The Warpia Easy Dock Pro solves this little dilemma by providing a wireless solution for your laptop multimedia needs. This specialized little product works with any television or monitor using either a VGA or DVI port in conjunction with a pair of USB wireless dongles. Is this device worth the stock $149.99 price tag? That is a question that will be answered with this review. The Warpia Easy Dock Pro, now supporting resolutions up to 1920×1080, allows you to connect your laptop wirelessly to your desktop monitor, keyboard, mouse, and speakers, or to your big-screen TV, without using cables. The Easy Dock Pro’s plug-and-play functionality gives you the freedom to walk away with your laptop, and then reconnect to your desktop environment or 1080p HDTV by simply walking back into the room. The set includes a PC Adapter and a pre-paired Display Dock (comprised of a Device Adapter and a Docking Base), enabling a quick, hassle-free setup and immediate operation. The Easy Dock PRO provides full room coverage, making it ideal for use with a large LCD screen, desktop keyboard & mouse and external speakers, without cable length limitations. Plug and play functionality provides users with the freedom of walking away with the notebook PC and immediately getting connected when re-entering the room. The Easy Dock can be used in single monitor mode, using your attached desktop display with the laptop lid closed, or can be used in dual monitor mode by using the laptop display as a second monitor instantly increasing workplace productivity.